Sussex Sharks secured their first Vitality Blast Finals Day appearance since 2012 by defeating the Durham Jets in their quarter-final clash by five wickets at Emirates Riverside. Fine bowling performances from Danny Briggs and Will Beer restricted the home side to 140 from their 20 overs, with Ben Stokes top scoring with 34 after the Jets opted to bat first. Although Durham made early inroads, Laurie Evans and Delray Rawlins were outstanding, with the former notching a composed half-century, to guide Sussex to a convincing victory. Sussex began to dry up the runs after Durham's early surge. Stokes paid the price for an ambitious reverse sweep off Beer falling lbw for 34. The pressure of the Sharks' spin bowlers paid dividends when Briggs trapped Tom Latham lbw for 16, while Paul Collingwood's advance down the track resulted in him being clean bowled by Beer. Briggs dropped Will Smith early in his third over, but when presented with a second opportunity he made a fine grab to leave the home side 92-5. Ryan Davies ended the Jets' boundary drought of 10 overs with a clip into the legside, but was then undone by a slower ball from Archer after guiding Durham past the 100-run mark. 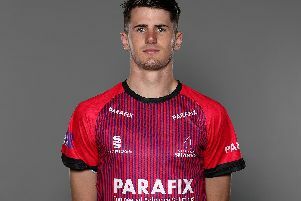 Stuart Poynter made a late dart with an innings of 28 to allow the Jets to post a total of 140. Rawlins arrived at the crease and took the attack to the Durham bowlers, crunching three boundaries to the fence. He continued to dominate the home side using his power put Sussex well ahead of the rate. A crucial moment in the game came with the Sharks 66-2 when Rawlins drilled a shot down the ground off Ben Whitehead, only to be dropped by Nathan Rimmington. Evans played the anchor role allowing Rawlins to continue blast away. Wood ended their partnership of 70 when he produced another sharp delivery before claiming the return catch to remove Rawlins for 42. Evans upped the ante to push the Sharks towards the victory line, reaching his fifty off 39 balls. Whitehead and Smith picked up late wickets, although Evans was there to guide his side over the line with back-to-back boundaries.